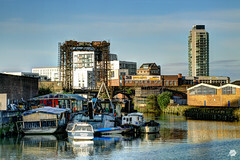 Featuring photographs exhibited in The Job Centre Pub and Deptford Lounge in 2017 and including a photograph from underneath Deptford Pier and a sunrise over The Tall Ships at the mouth of Deptford Creek. This project started for the European River Corridor Improvement Plans project between May 19th - June 17th 2014. Because there is so much construction taking place I have revisited this project from 2016 onwards as the landscape changes. Special thanks to my old college tutor Richard Lawrence for letting me have access to the roof of the APT Studios for many of these photographs. The River Ravensbourne is a tributary river to The Thames which starts in Bromley and has a history going back to Roman times. Since 2006 Lewisham Council has made a great effort to re-naturalise a forgotten urban river. The European River Corridor Improvement Plan is a three year project to write a policy on how to improve river corridors with nine European partners from five countries.